Tanaka's TCS33EDTP-14 32cc Gas 14 in. Top Handle Chainsaw provides professional features and power at an incredible value. The powerful 1.6 HP PureFire commercial grade engine, combined with the Tanaka bar and Oregon chain, delivers unmatched cutting power for professional or light-duty use. 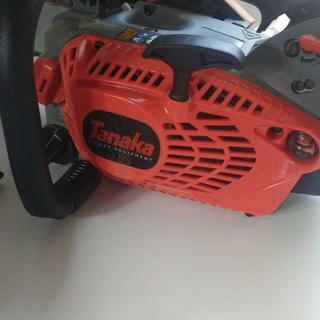 Whether it be for professional use in the outdoors or just around the house, Tanaka's 32cc Gas 14 in. Top Handle Chainsaw offers professional performance at an entry level price. This is a great little saw that can be used for so many different projects. Light weight, powerful when used properly. I had been waiting for the right price - got it and glad I did. 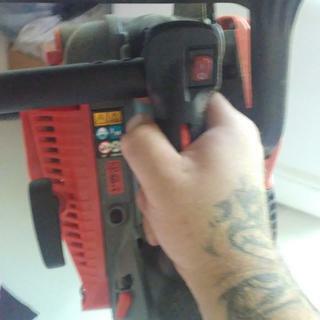 Bought this saw and hand it over night shipped it was here in the morning the package was not damaged and it was the product pictured i took it out of the box and fired it right up only needing a minor tweek to the T skrew to slow the idle down its a nice little saw for what it is its the cheapest top handle on the market and has the best warranty (make sure to register your product. But it cuts nice the 14 inch chain ripped through an oak log twice the size. Let the saw do the work and dont force it if you force it it jams if you let it work its got a fairly impressive cutting speed throttle response is there but could be better. You figure a 201t is 649 and some change and is 35 cc and pushes 2.1ghp this little guy is a tgird of the price 32 cc and pushes 1.6 sorry but half a ghp isnt worth 400 extra dollars this will be plenty powerfull enough. I had several trees @ 75' tall. This saw made short work at limbing large 12" branches 30' off the ground. Would have hated to do that with my 20" Husqvarna. It, also, does a really nice job on the ground cutting up the little stuff instead of packing around the extra weight of the big saw.And, with the 7 year warranty, I just don't believe you can find a better bargain. Great deal on this little powerhouse of a trimmer, & lite enough for tree topping. Oregon Chain makes this cut better than most stock saws. 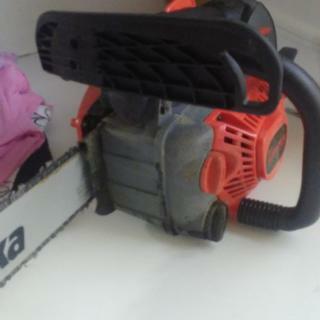 What is warranty on this saw new and refurbished?? How much does saw weigh?? I cancelled my order of this highly regarded Tanaka chainsaw after reading comments about higher safety risks of top-handle vs rear-handle saws for ground use. Can you explain why top-handle saws should not be for ground use? BEST ANSWER: Your question would best be answered by the manufacturer.Please contact Tanaka direct at 1.800829-4752 for technical assistance. The article avoids the WEIGHT? What is the weight LBS. ?